delicious inspiration. 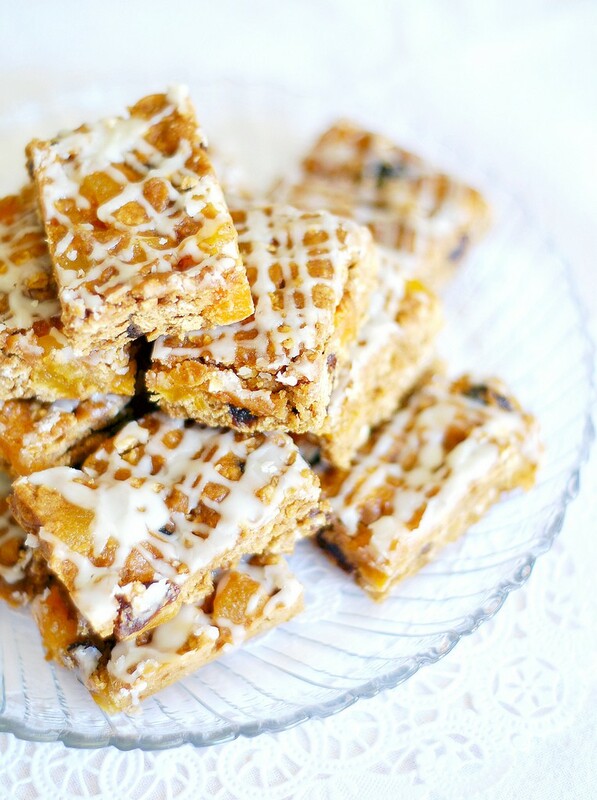 : Apricot-Raisin Oatmeal Bars. Last night I had a craving for chocolate. So I looked through some recipes and decided on a chocolate drop cookie that seemed like it would be delicious with white chocolate chips in the dough and coated in confectioner's sugar before baking. The recipe was unfortunately a disaster. The dough came out dry and sandy, I had to knead it in order to get any cookies out of it at all, then after baking they tasted more of flour than chocolate. Needless to say I think something out there was telling me to bake something healthier, something more wholesome than chocolate cookies. Preheat the oven to 350 degrees F. and line a 9x13 glass baking dish with foil or parchment paper, then spray with cooking spray and set aside. In a small bowl, combine the flours, salt, baking soda, cinnamon and oatmeal. In a larger bowl, whisk together the egg, brown sugar, yogurt, water, molasses and oil. Add the dry ingredients to the wet ingredients and stir until almost completely combined, then stir in the dried apricots and raisins. Scrape the batter into the prepared pan and bake until a toothpick inserted in the center comes out clean, about 20 to 25 minutes. Let the bars cool on a rack, then whisk together the confectioner's sugar and orange juice until you have a thin, drizzleable glaze. With a fork or spatula, drizzle the mixture over the bars. Let cool completely, then cut into bars. Store airtight for up to 5 days. I am sorry your chocolate chip cookies didnt work out for you, but seems like you got a winner here. I love dried fruits in my cookies, this is something to satisfy the sweet cravings minus all that butter! Yum, looks delicious... I will definitely be giving these a try! 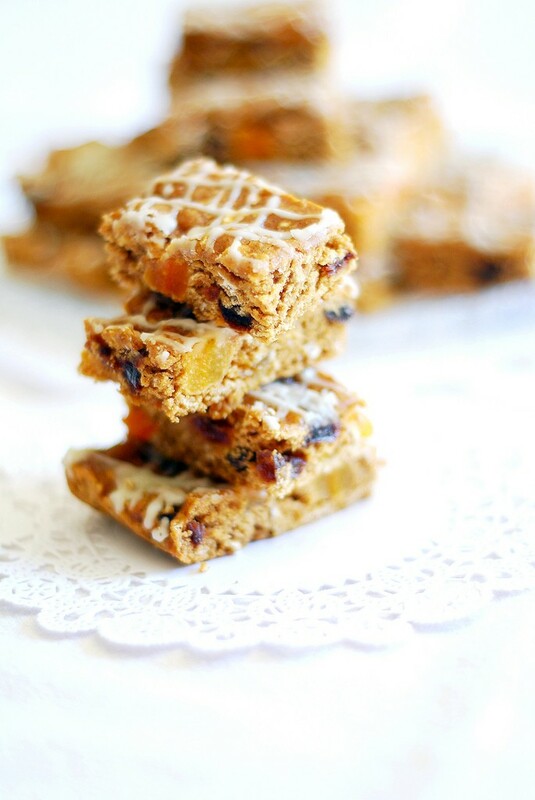 I've never used dried apricots in a cookie bar, I will have to give these a try! These little treats along with a cup of hot chocolate is all I want right now! 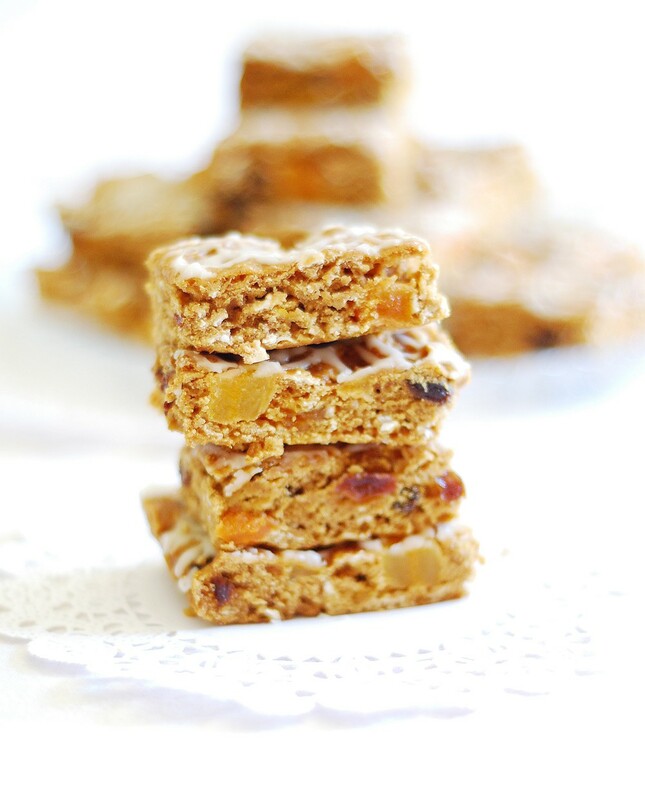 I'm always looking for healthier snacks like this, so I can't wait to try these. I think I'm going to make some tonight! Oh yum, I'm a big fan of oatmeal bars. The last time I made it, it turns out decent but not extraordinary. I bookmark the recipe. That looks great and delicious ...! !